A car accident can make the most level headed of drivers shaky and frazzled during its aftermath. However, with a little preparation and the right gear, you can ensure that you’re properly prepared to handle a vehicle accident. This article provides the details of how to remain safe after the accident. 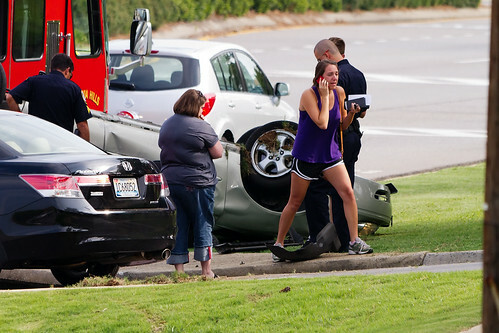 If you suffer a serious injury during the accident you will need a professional to deal with the insurance company. The website of Howell and Christmas LLC car accident lawyers states, "You will have medical bills to address, the property damage to your vehicle, and you may not be able to return to work so that you can earn money to pay all of your other bills. Don’t make the mistake of trying to deal with the insurance company yourself. Give yourself the peace of mind that comes with hiring an experienced trial lawyer to represent you." Millions of vehicle accidents are reported by the police each year across the United States. If you’re one of the unfortunate drivers to become involved in a car accident, the first thing you need to remember is to try to remain calm. An emergency kit should also be placed in your glove compartment and include items that will be helpful in the event of an accident. After you’ve assessed the situation and determined if there are injuries, you can call for assistance from your fully charged cellphone. Your cellphone can also take pictures of any damage before the police arrive. A list of important phone numbers should also be stored in your phone and include emergency contacts, insurance company and local law enforcement agencies. If the vehicle that was the main cause of the accident tries to vacate the premises before information has been exchanged, you can gather as much information as possible to help the police catch the culprits. Pen, paper and an insurance card can be used to exchange important information related to the participants in the vehicle accident. Other items helpful in an accident can include emergency flares, flashlight and blankets. After assessing the damages and ensuring that there aren’t any serious injuries, you should immediately move your vehicles to a safe location such as a nearby parking lot or the side of the road. If a car sustained serious damages and cannot be moved, you can wait until help arrives. Your emergency hazards can be used to alert other drivers and any law enforcement officials of the accident. A police officer or sheriff can be helpful in writing up the accident report and allowing the other drivers to exchange information. Cellphone pictures, insurance cards, street addresses and a detailed description of what actually happened can also be helpful. However, never tell anyone that you were at fault for the incident. It’s also important to get a business card of the officer filing the police report, so you can get a copy and send it to your insurance company. This will be necessary when you want to make a claim with your insurance provider and seek compensation for any damages to your vehicle. Immediately after your accident, you’ll need to notify your insurance provider. You can then fax over the incident report, photos and any other information that may be helpful to your claim. If your accident was of a serious nature, you may even need to seek the assistance of an experienced and professional accident attorney. They’ll be able to handle and assess the damages, injuries and fatalities caused by your vehicle accident. Vehicle accidents can take a serious toll on a person, both mentally and physically. By keeping calm and being prepared with the above tips, you’ll be able to handle the trauma associated with your unexpected emergency. Teresa Stewart is a freelance writer who frequently researches car accident laws. She has found that Howell and Christmas LLC car accident lawyers have first-hand knowledge of the tactics of insurance companies which has helped them to successfully maximize their client's insurance claims.